Jungle Red Writers: Can You See the Future? HANK PHILLIPPI RYAN: It’s like—thick crust or thin? Pie or cake? Letterman or Leno? (Kind of.) Almonds or plain? Everyone has an absolute preference. Plotter or pantser? Every writer has had the conversation a blue million times—and we could all have it another blue million. Because it’s all about how a writer’s brain works. And, as we know, that’s constantly surprising, endlessly changing, and never predictable. So hurray for the fabulous Judy Penz Sheluk—who pantsed her way to her debut novel! Do plotters brainstorm? I’m assuming that they do, and during the process, they probably take notes or draw up diagrams—a roadmap, if you will, that takes them from Chapter 1 to the last satisfying sentence. Life isn’t quite as structured for us pantsers. Oh sure, we brainstorm ideas, but we tend to do it “on the go.” Think of it this way: Your destination is a town called The End. The plotter dutifully checks their roadmap, plugs in all the info into a GPS, just to be on the safe side, and in some cases, even prints off street-by-street instructions before setting off. It’s efficient and they’re bound to get to The End without getting lost. The pantser, on the other hand, just hops in the car with only a vague idea of where The End is, and they’re not entirely sure how they’re going to get there. That, you see, is half the fun of the journey. True, they might go off course, but sometimes, those detours take them to places they never dreamed possible. If you haven’t already figured it out, I’m a pantser. It’s not that I don’t admire plotters—I do, and even tried to become one. I went so far as to take an online course on plotting. 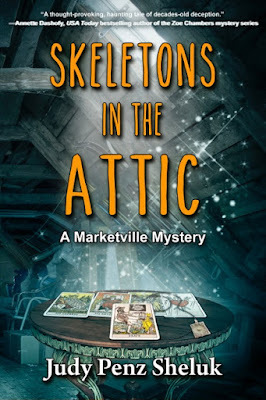 Came up with a dandy outline for my latest book, Skeletons in the Attic. There was just one problem. By chapter eight, I really wanted to take a detour. For a while, I ignored that inner voice and kept on plodding along, every paragraph written coated in concrete. I’m not sure at exactly what point I tossed the outline and went back to pantsing, but I do remember the feeling of liberation that came when I did. I honestly wanted to run out into the street yelling, “I’m free!! !” but of course, I didn’t. My neighbors already view me with a modicum of suspicion. What sort of person writes murder mysteries? I suspect my dislike of plotting stems from what I view as the confinement of it—although I’m sure even plotters deviate from their outline on occasion. But a lengthy career in the corporate world as a Credit & Collections Manager (among other things) left me craving a life where I didn’t have to work 9 to 5. And an outline, to me, is like being forced to work 9-5 again. That doesn’t mean I don’t put in the hours, varied as they might be. When I’m working on a book, I aim for a chapter a day, and I always try to leave a hook at the end, so I’ll want to come back and write the next day. Some days, that chapter flows, and some days, every word is hard fought. But then I look around my home office, painted a beautiful Philipsburg Blue (thank you Benjamin Moore), and I know I’m going to get to that town called The End. In my way, on my terms. It doesn’t get any better than that. HANK: With ya, sister! I love THE END, and you know—I almost love almost being at the end. That excruciatingly great moment when you can feel it coming. Judy’s book features a psychic—wouldn’t that be nice to know how your book ends? And hey Reds, have you ever been to a psychic? Tell all! 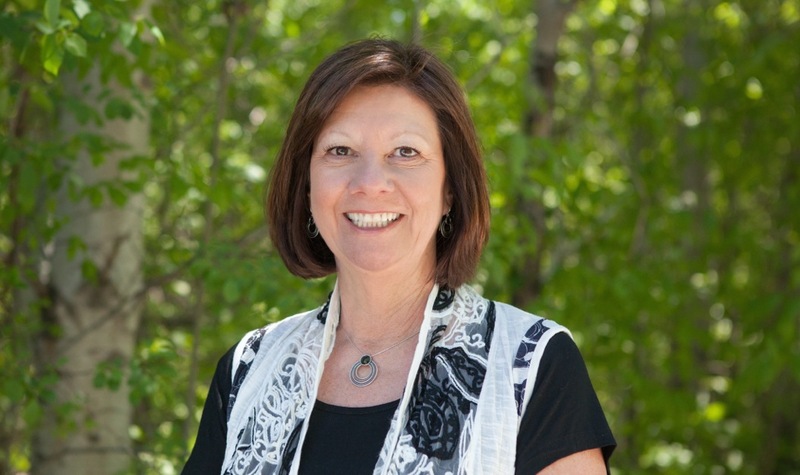 Judy Penz Sheluk escaped the corporate world in 2003 and settled into her new life as a freelance writer and editor. Her debut mystery novel, The Hanged Man’s Noose, was published in July 2015. 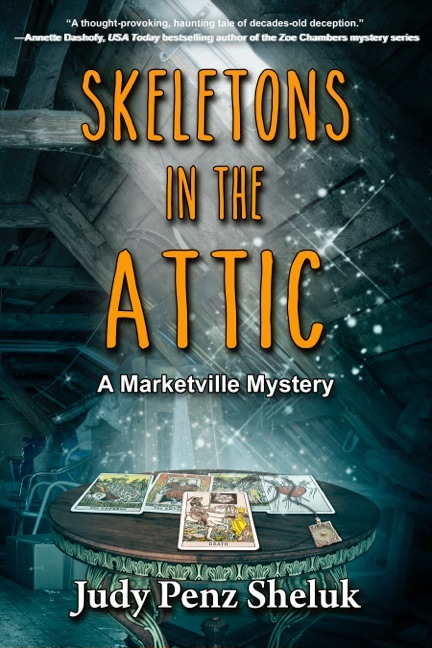 Skeletons in the Attic, the first book in her Marketville Mystery Series, will be published August 21, 2016. Congratulations, Judy. Your book sounds quite intriguing and I’m looking forward to reading it. Been to a psychic? Nope, but there are days I’d give almost anything for a glimpse into the future . . . .
Congratulations on the book, Judy. It sounds fabulous! Yes, I did go to a psychic. When I worked on Lincoln Road in Miami Beach (way before it was trendy, or should I say when it was between tres chic and trendy) the Road had a psychic fair. As a lark, I stopped at a table and paid my five dollars. The woman told me I would go to live in a very cold climate. I totally discounted her statements...until 20 years later, I moved to the crown of Maine. I would love to find that woman again! Congrats on the book, Judy! I'm a pantser for short fiction. I think of an opening line, and no idea where it will go, what will happen, or who will appear. Fun! For longer works, I am a planner, so I suppose I am a hybrid too. I've never been to a psychic or had my palm read. I need to liven up my life. Judy, congrats on your book and delighted to have you visiting here! This sounds like a wonderful premise. Can't wait to try your book! Judy, welcome to Jungle Reds and congrats on the new book. I'm right there with you - I ALWAYS know how my book is going to end and I'm usually wrong. Hey, surprise yourself and you're sure to surprise readers. Thanks Hallie and Hank for inviting me to Jungle Red. Thank you Lucy for the congrats. I learned a bit about tarot while researching for Skeletons (and quickly discovered it would take years to really understand tarot). Thank you Ramona for stopping by. I'm sort of the opposite of you, when writing. My short fiction, while I don't have an outline per se, I do know what's going to happen/how it's going to end. I never know that going into a novel. Thanks Edith for pre-ordering. Much appreciated! Thanks Kait! Your story about the psychic reminds me of my own story. In my early 20s, I went to a woman who read tea leaves. She told me I'd marry a man with the initial M and live in a gray house in the shape of a L and that there would be a fire station and a river near by. Fast forward 10 years and guess what? Married Mike, moved to Holland Landing (about an hour from where I had been living). The house was a gray brick side split, the garage formed a bit of an L, and the Holland River was across the street. And there was a fire station a mile away. Stuff like that...makes you wonder. Thanks Joan. It's funny, when I was younger, I wanted to know what would happen (would I marry, be rich, have kids). Now I don't want to know what's ahead. Judy, I agree. Sometimes. Better not to know what's ahead. Because you never really know, so why think you know? But that's a pretty amazing story.. WHen you met Mike did you think--wow? I'm ALWAYS tempted to go to a psychic, though. Roberta, I'd love to hear. Congratulations on the new book Judy. I just put it on my TBR list. Yes, I have been to a psychic. It's a lot like going to a therapist I think. They are very adept at reading moods and expressions and mirroring what you tell them. I ended up reading my own mind! If you haven't gone to one, I'd say save your money. "... scheming psychic named Misty Rivers ..." I once had an employee, a nurse, whose name was Misty Storm. No kidding. I could barely say it without seeing her wrapped around a pole wearing a G-string and pasties. What on earth were her parents thinking? Judy, congrats. I love this line. "And an outline, to me, is like being forced to work 9-5 again." I feel the same way. I'm another hybrid writer. For novels, I *think* I know the killer and I'm usually wrong. This current novel, I'm not even trying to force it. But for short fiction? Total pantser. I start with a line and a premise and off I go. I've never been to a psychic. Part of me is curious, part of me just doesn't want to know. Ann in Rochester - now way. That was her REAL name? Wow. Yes, agreed, Lucy. Sometimes people say to me--how did you predict THAT, wow. And it's all just..listening. And then thinking about motivation and outcome. And that is so fascinating, too..that the psychic sets your intent. Hmm. Thanks for stopping by Susan. What's a pet psychic? I've never heard of that (but it does sound like a good premise for a story). Ann: Misty Storm? You're right...what were her parents thinking? I went to a psychic years ago. First thing she said was "Who is Joe??" I was still skeptical, although surprised, as Jo was my then partner's name. Her next statement blew her credibility.. "HE.. etc.." nope Jo is a she. However, it was a fun experience. I think there is something to paranormal behavior. However I think I dealing with a not so clever con artist. That's funny, Coralee. I suppose we all know a Joe (although I don't know any...) but it would be like saying, "who is John?" Safe bets. Yes, Ann, I can see where that could happen...and also I think we hear what we want to hear and disregard the rest! Thanks for stopping by and taking the time to comment. I did see a psychic at my husband's urging in N.O. years ago. It was to be for entertainment. She read my palm and made some dire predictions about how I might fear for my life but I would be fine. I had gall bladder surgery a couple of months later. But I can honestly say I was never in fear for my life! Years ago when I was 11 or so we visited Disneyland. One of the Main St. shops had a fortunetellers machine. I kept the "fortune" for years. It was a love letter from Frank. Anyway I forgot all about it until I came across it a few years ago. I had a good laugh. Darned if I didn't go and marry a Frank! We'll be celebrating 44 years this month. First off, Judy, that is one perfect cover, down to the colors used. And, of course, the title is equally inviting. Then, there is the story line. I'm hooked and can't wait to read it. Thanks for sharing your pantser method of writing. I think my lifestyle is pantser. Due to the influence of a certain Red, Lucy, I have had a Tarot card reading in Key West with Lorenzo/Ron. It was a bit scary for me, and it wasn't as upbeat as I'd hoped, but all turned out well. I might do it again. Not sure. HI Pat. That's cool that you kept that "love letter" all those years. Happy Anniversary as well. Kathy: Thank you so much. The cover was designed by Ryan Thomas Doan. He asked me for a list of things that were important in the book. I told him: the attic, which is creepy, the tarot cards, and a locket, which I sent a photo of (I'd seen it on Pinterest). He totally nailed it. I've never had my tarot cards read. I did buy a book about them and a deck of cards while researching for Skeletons, but I can never bring myself to read my own cards! Congrats, congrats on the new book and series. Really sounds interesting. And I loved your line about plodding along to the outline and each paragraph covered in cement. I'm a plotter, so I love seeing how the other side feels. For me, the only cement is the foundation to my story, but I can absolutely see how it would feel like it was going the other way for the pantser. Good luck! Thank you Ritter! I do envy you plotters, in much the same way I envy someone with a spotless house (I have a Golden Retriever...enough said). But I wouldn't trade my dog for a clean house, and I wouldn't trade pantsing for plotting...I love how every writer has their own way of doing things. Pat D--aw. Even so, I love it. And I do, too, Judy.Every person does it differently--how can that even be? And agreed, way to scary to do Tarot. Thanks "Return Man 2" -- I hope you enjoy the book. I appreciate your support. Hi Kate, that is a great story and yes, writing is the best job ever! Congratulations, Judy. I look forward to reading your book. I'm a pantser, too, and no I would not want to see my future.